I did a post back in May regarding Stic.Man from Dead Prez's last cd, The Workout - and I'll be honest, the post didn't get a lot of love. No sweat off my back - that cd is still one of the top 5 cd's I purchased in all 2011. 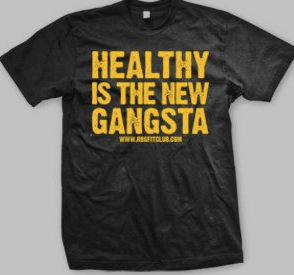 Stic.Man is still promoting a heathy living with his newest fitness related shirt - Healthy is the New Gangsta. In this trend based world - might as well stick with a fad that's good for you. Purchase the shirt here, and check out a promo vid/interview after the jump.